In the light of the discussion at Feed line length affect on VSWR and The half waves of coax rule for measuring VSWR accurately, lets consider the subject question and develop a rational answer. There can be no doubt that, all other things equal, the most direct measurement reduces the total estimation error. That said, it is the “all other things equal” provision that is relevant, and at the end of the day, a more intelligent approach is to rationally trade accuracy for factors like convenience, safety etc. The oft heard advice to disconnect the feed line and connect the instrument right at the feed point appeals to simple folk, but disconnecting the feed line has changed the nature of the thing being measured. So, if using a self contained meter, such as a modern analyser, it is important to maintain the common mode current path to not disturb the thing being measured. VSWR does vary along the transmission line, and manner that is predictable from impedance and line parameters. So, it is possible to back out the effect of a known section of transmission line to refer measurements at one point to another, eg to the feed point. 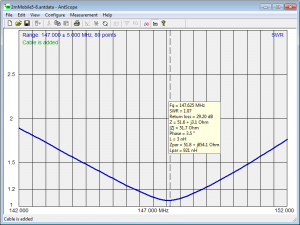 Fig 1 shows a VSWR measurement of an antenna system captured with a Rigexpert AA-600. 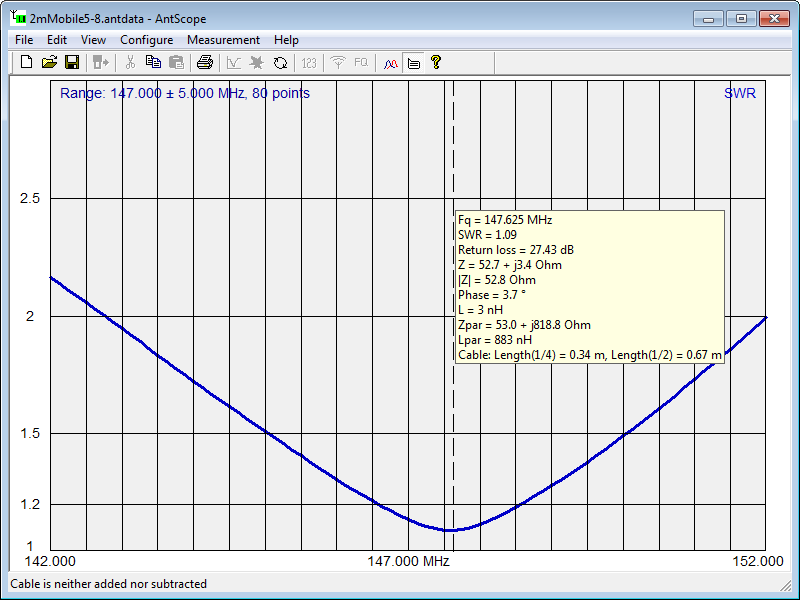 The measurements were made looking into 4m of RG58C/U. Fig 2 shows the same measurement referred to the feed point. It can be see that in Fig 2 VSWR is always higher, and that the curve is steeper each side of the minimum. Note though that the difference at very low VSWR is almost insignificant, but it is greater at higher VSWR. 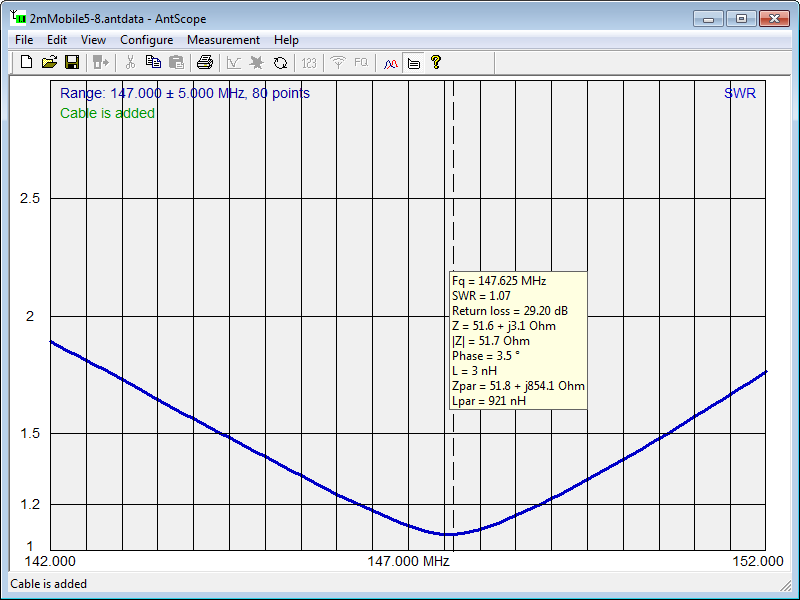 Had the measurement in Fig 1 been made through a further 4m of line, the results would be as in Fig 3, a flatter response and slightly lower minimum VSWR. 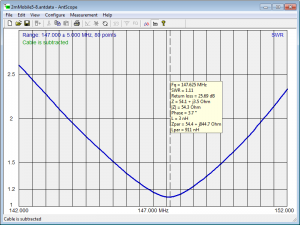 The impedance at one point can be referred to another point knowing the transmission line parameters. 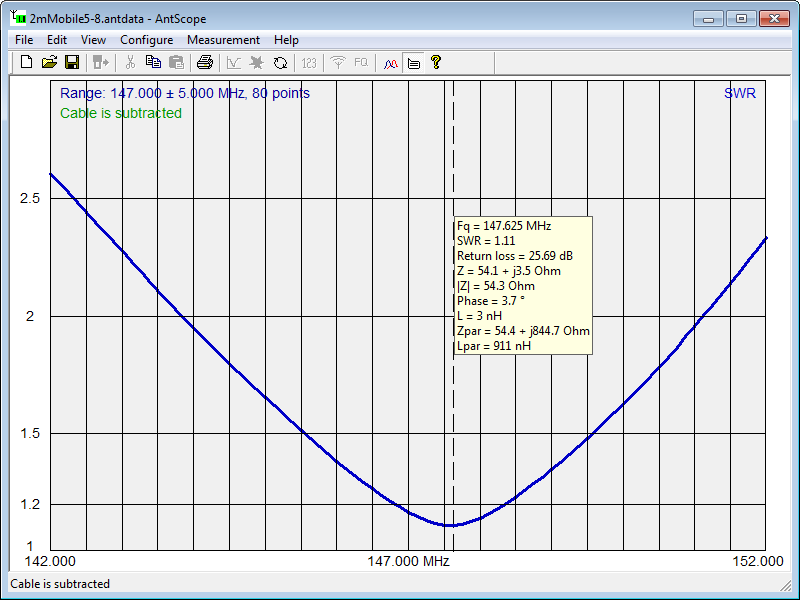 VSWR can be calculated from impedance (but not the reverse). RF Transmission Line Loss Calculator (Duffy 2001) contained a database of popular transmission lines and could calculate the impedance and VSWR at a point from impedance at some other point. There are other calculators that purport to do the same thing, I cannot recommend any as I use TLLC, but the VK1OD website is no longer online. A less accurate method is to project VSWR based on line attenuation alone. VSWR Calculator does that, and there are notes in the accompanying text about limitations of accuracy. If your instrument’s basic measurement is of VSWR, then this is the technique you use as you don’t know impedance. You must ask whether feed point VSWR is really what you want to know. It is a common method of evaluating behaviour of an antenna that should have some known VSWR at the feed point, eg the commercial vertical antenna used for the examples above. But, you should ask the question for each situation. Feed point VSWR might not be the needed metric in some situations. Feed point VSWR can be estimated from measurements made at another place if the transmission line parameters are known. It, like all measurements, is subject to error but it may be a manageable error and indeed possibly better overall than direct measurment. A rational decision on where to measure considers the required accuracy, convenience, access, safety, and facts that are known (like line parameters). Ham folk-lore on the matter is ill-informed, and usually propagated by those who just don’t understand the subject. Duffy, O. 2000. VSWR Calculator. https://owenduffy.net/calc/tl/vswrc.php. ———. 2001. 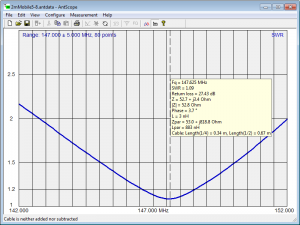 RF Transmission Line Loss Calculator (TLLC). VK1OD.net (offline).